Today in Barkerville a friend of mine (who plays Mrs. Bowron, a Barkerville schoolteacher) was contemplating a moth she had recently rescued in the schoolhouse. The insect was resting on her wrist as she pointed out to me its distinct colouring and the soft quivering of its wings. “She does that to stay warm,” she informed me. Earlier in the day Mrs. Bowron had shown me chipmunks, swallows, and spiders and in each instance she taught me several scientific facts about each species of critter and crawler that inhabits our historic site. My friend’s assertion gave me pause for thought. I guess I do know a lot about history. Or, to be perfectly honest, I know an awful lot about how to interpret history. I didn’t set out to become a professional museum interpreter. Like many others who work at provincial heritage sites, I practically stumbled into this vocation. Immediately after graduating from the University of Victoria’s Theatre Department in 1989 I happened to notice an ad in my local newspaper seeking an actor to play the young Emily Carr at her childhood home in an historic James Bay neighbourhood. I got the job, and unknowingly embarked on a career, now more than two decades old, that has taken me to provincial and national historic sites all over British Columbia. Some people who find themselves swept into the world of historical interpretation enjoy a season or two of the work and then move on to other projects. In the case of many actors, these projects often lean toward more “traditional” roles in theatre, film or television. Others, like me, find museum work endlessly challenging, fascinating and fulfilling… and so choose this path as a career. I love historical interpretation. I love that my job consists of a constantly unravelling story. I am always searching for more evidence, more information, more understanding of a particular time and place. I love that my overriding research subject is BC, but that within our provincial history there is an infinite number of stories, and that British Columbia itself fits into an infinite number of other stories involving the world as a whole. There is no end to learning and seeking to understand more and more about this place we call home. Also, I love my job description. I am, indeed, an “interpreter” of history. As I continue to accumulate knowledge, everything I learn is filtered through and shaped by everything I already know and all of the experiences I have had in my life so far. 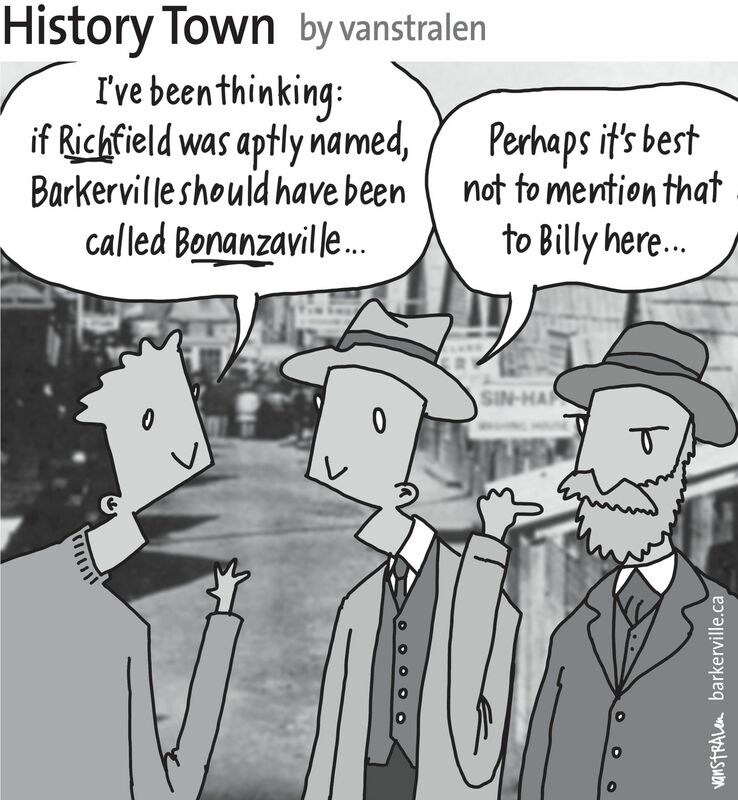 This is also true of every visitor who ever journeys to Barkerville. Guests to our site can only interpret the things I tell them. Everything they see and hear and experience must be filtered through the lenses of their own lives. As an historical interpreter I have the opportunity to speak to people from every corner of the world (just today, for example, I spoke at length with visitors from Canada, the States, Northern Ireland, the East End of London, and Chile). The stories they hear me tell about BC’s foundation days spark conversations about their own homes, their own lands, their own lore. As guests share their stories with me, I add these ideas and concepts to my own vault of understanding. By listening to and talking with visitors, I become a better interpreter. Barkerville allows me to connect with other people using a language we all understand – the language of storytelling. History is a very human idea. The need to come to know ourselves through the act of telling and retelling stories from our collective past is a uniquely human endeavor. Our legends give context to our lives. When we place ourselves within the timeline of a larger narrative – into history – we make sense of ourselves. Museums are places where people come together as humans to celebrate, examine and marvel at who and what we are, where we’ve been, and where we might be going. Telling our stories is the way we come to appreciate the fact that we are more alike than we are different. Mrs. Bowron was right. I do know a lot about history… but that doesn’t mean I just keep a lot of dates and facts stored in my head. It also means understanding that history is a great gathering of stories with no end and no beginning. A good interpreter has the desire and ability to offer thoughtful analyses of these stories while remaining wide open to new ideas and fresh interpretations that come to us from the tens of thousands of people who visit heritage sites every year. For that, and for them, I am truly grateful. I am also grateful to the girl I was twenty-five years ago; the young woman who answered a newspaper ad seeking someone to play young Emily Carr, without having the slightest idea of the lifetime of historical adventure that decision would ultimately bring. The above one-panel cartoon (originally published September 20th, 2014) by Dirk Van Stralen, with accompanying editorial by Danette Boucher, is the nineteenth of twenty weekly entries that were logged – and subsequently blogged – as part of a 2014 collaboration between Barkerville, British Columbia and the Prince George Citizen aimed at introducing some of the quirkier advantages to living, working, and playing in the Cariboo Goldfields. We hope you enjoy!